It’s a funny thing to ponder, but to me, the smaller the person, the bigger their emotions seem to be when they are expressed. Children can’t help but become completely covered in joy and laughter from head to toe when they are happy. Giggles and smiles burst through their faces, feet and hands bounce, and all that energy is wonderfully contagious! But it is during these first few years of life that we also experience the crocodile tears over an unexpected tumble; the unimaginable strength of the pouty face in the checkout line inconveniently stocked with candy at arm’s length; the sudden meltdowns over a sandwich not being cut right or different foods forbiddingly touching each other on a plate. The world is a BIG place for the tiny humans we guide through it all. Luckily, a slice of pizza can fix just about anything! 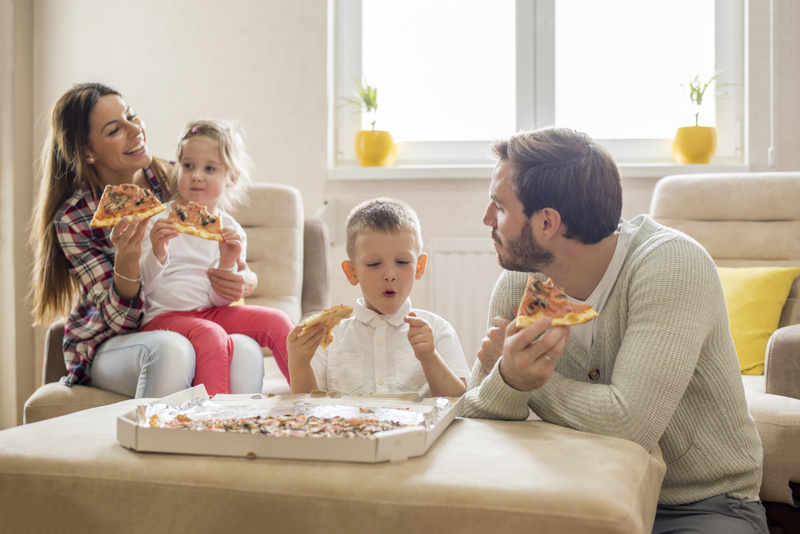 To be clear—I’m not suggesting we start a lifelong pattern of emotional eating and bribe our little ones with pizza to make everything better. We’re not going to eat this pizza, but in therapy I often use pizza as an analogy to work on calming skills. A stressful situation can trigger stress hormones in our bodies and send our sympathetic nervous system into overdrive. Children (even adults!) struggle to make sense of the warning signals their bodies are sending them, and without guidance what’s a kid to do with such strong emotions? Controlled breathing helps us to counteract the stress responses in our bodies. This is where I step in with — pizza breaths. Counselors use the “4,7,8” rule for controlled breathing: breathe in for 4 seconds through your nose, hold it in for 7 seconds, then exhale continuously for 8 seconds. That’s a lot of counting and holding your breath for young children and toddlers. But pizza breaths are easy to remember and fun! So how does pizza breathing work? First, smell the pizza by breathing in through your nose. Imagine holding a slice of pizza right up to your nose and inhaling. Yum. Take 4 big seconds to sniff that pizza goodness. And then hold it all in, savoring that delicious smell for 7 seconds. So exhale from your mouth to cool your pizza down for 8 seconds! Inhale through the nose for 4, hold it for 7, and exhale through the mouth for 8. The next time your little one needs a starting place to calm down and process those big emotions, try a few pizza breaths, and watch how a simple exercise like this one can help your child get control of those emotions in a snap. Sarah Harrison is a Licensed Marriage and Family Therapist working at Grace Counseling with kids, teens, couples, and families. She is Trauma-Focused Cognitive Behavioral Therapy Certified, Level 1 Certified Gottman Therapist, and has an extensive background working with children, teens, and families. Much of her previous experience has called her to focus on helping improve how the family unit functions, and she loves helping families here at Grace.